The Portland Trail Blazers aren’t perfect. Their explosive, rangy backcourt can still be exploited on defense, they lack that one killer swing player, and with the starting center’s injury, they can be overpowered in the middle. The Oklahoma City Thunder aren’t perfect either. Their firecracker point guard can’t shoot from distance, their killer swing player is clearly hurt, and everyone else on the roster is limited in some way. These teams aren’t tragic would-be world beaters cursed with facing either other in the first round. They are flawed second-tier teams reliant on luck, timing, and more luck to make a real statement in the 2019 Western Conference playoffs. No one would really expect either to make a deep playoff run in a vacuum, especially after each was embarrassed out of the first round last season. In fact, that embarrassing 2018 means simply winning this first-round series could be enough to bring some warmth back home, to save everyone’s jobs and the future, to sow hope for next year’s harvest. Just that is at stake in this Blazers-Thunder series, and that seems like so much when you consider what goes into a season and a playoff run. Damian Lillard continues to say all of the right things as the leader of the Blazers, and there isn’t much indicating he’d leave Portland if they continue to fall short in the playoffs. But the mere threat of that in a star-shuffling modern NBA must surely weigh on the decision-makers and potential collateral pieces in Rip City. For instance, would another first-round dismissal get Terry Stotts ejected? What about Neil Olshey? Would C.J. McCollum immediately find himself on the trade block, or would the front office — Olshey’s or a replacement — just rip up the whole team outside of Lillard and an injured Jusuf Nurkic? The Blazers stayed static after the short-lived Pelicans swept Portland’s feet out from under them last year. Could they do it again? Neither Russell Westbrook or Paul George are going anywhere for the Thunder, but the specter of Westbrook’s ticking timebomb knees must keep Sam Presti up at night. Given the point guard’s playing style and previous surgeries, it would surprise no one if we woke up someday and Westbrook’s contract looked something like John Wall’s. There are fewer fears around George, but you need both of them to be dangerous in the West. The Jazz waxed the Thunder a year ago, with Carmelo Anthony taking a good deal of reputational damage in the process. Presti made some interesting moves to extinguish the ghosts, but they might come slithering back if this series goes sideways. What then? What other tricks can Presti pull? Lillard rescued the rest of his failing squad, and the Blazers picked up a key victory. 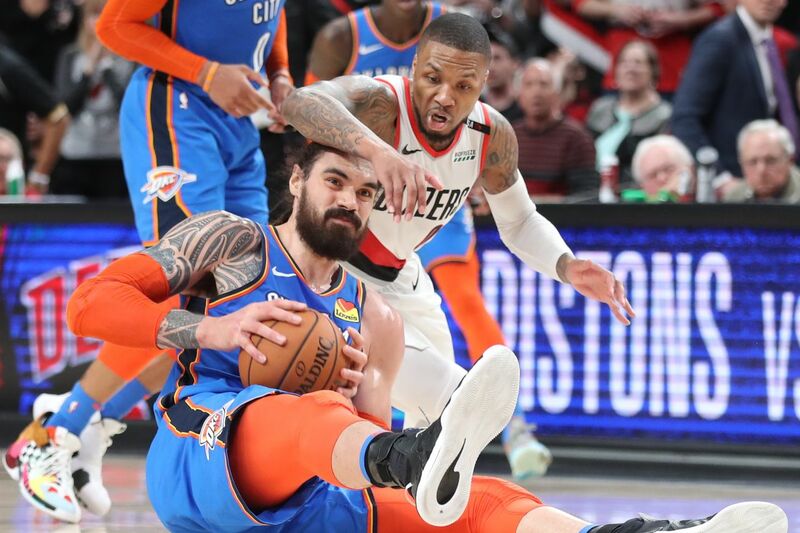 None of us know where precisely this series will go next, and a lot depends on whether the spaced schedule gives George time to recover, whether Enes Kanter can continue to outplay Steven Adams, whether Jerami Grant or Westbrook start shooting well, how the officials call contact, whether McCollum can light it up. That’s what’s so interesting about the narrative baked in here: this is a toss-up series. Neither team has an overwhelming expectation to win it. But given the past, both teams had better win it, or someone, somewhere will demand some action to respond to a loss. It’s a pretty normal reaction — change is the offspring of failure in most areas of life — but it’s put in its starkest, most high-stakes terms in sports. Losing to the Blazers could be seen completely acceptable for the Thunder: Portland is a damn good team. Losing to the Thunder could be seen as completely acceptable for the Blazers: Oklahoma City has a dream duo and solid roster. But given the context, the narrative, and the recent past, neither team can afford to lose this series and keep on the same path. It adds a level of drama to the proceedings. It winds the string a little tighter. As a neutral fan, it’s kind of awesome. But we have to acknowledge the drama’s presence and genesis, and we should acknowledge that while it’s unavoidable, it’s kind of weird that so much is wrapped up in winning something it’d be so understandable to lose. Perhaps the irrationality of it all is something we love about sports. Unnecessarily high stakes are all around us. At least in sports, they are fairly inconsequential to our daily lives.